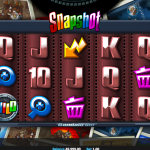 Snapshot is a video slot game from Realistic Gaming that celebrates the photography, and everyone who enjoys taking photos will enjoy this game. The theme of the game is unique but the design of the game is not up to the highest standards of this provider and the brown background of the reels seems kind of uninspiring. There are some fun symbols though, like the “delete” symbol that we use so much when we capture our precious moments. There are 2 special symbols in Snapshot, the wild and the scatter. The wild symbol stands in for every other symbol except the scatter to complete a winning line. The scatter on the other hand activates the main feature, the free spins round. 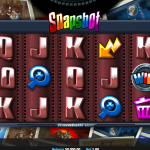 You need to land at least 3 scatter symbols anywhere on the reels to receive 10 free spins. During the feature an extra Snapshot symbol will appear on the third reel and every time it is a part of a winning line it will double the win. The only downfall in this game is that this is the only feature and unfortunately it cannot be re-triggered. Snapshot is a pretty basic game and Realistic Gaming did not put too much effort in making this game unique. We have the usual simple game play with only one feature. Even though it is our favorite main feature, the free spins round, still we would not mind another mini bonus game though. The only thing that is worth mentioning here is the betting range. 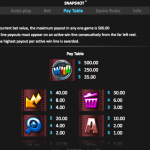 The betting options are so wide and made to suit every player’s need. So, if you do not mind the simple game play you can find the right bet size for you, whether you are a high roller or low roller. For another great engaging game you should consider playing Snakes & Ladders a 3 reel slot by Realistic Games.